The forum module can consist of multiple Forum Categories. 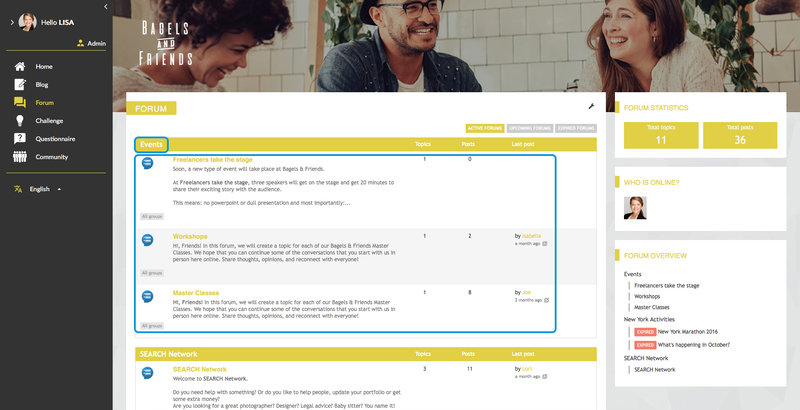 In each category, multiple Forums can be added. In their turn, forums can consist of multiple topics. Finally, users can post comments on these topics and reply to, and quote each other’s comments. In the example below, you can see how Forums are structures. Events is the first category and the forums Freelancers take the stage, Workshops and Masterclasses have been added to this category. Please keep in mind that a forum category is necessary in order to create a forum. Adding forum topics to a forum should be done in the front end of the platform. You are now on the Overview tab. To change the order of the Forum, select a forum category next to this tab. Now click on the Sort icon at the top-right corner of the page. You can now drag and drop your items in order of preference.